‘I’M THE PARTY LEADER , MUDZURI raise your hand first if you want to be given permission to the speak next time’-warns Chamisa. He then reminded Mudzuri that he was the president of the party and the rightful chairman of the meeting. He rhetorically asked Mudzuri to go upfront and chair the meeting if he thought he was capable and when Mudzuri remained glued to his seat, he (Chamisa) reminded him that he chided him saying he needed to learn to raise his hand first if he wants to be given permission to the speak next time,” another source who attended the meeting said. MDC-T political bigwigs are on a renewed collision course over attempts to oust some senior party members critical of its president Nelson Chamisa’s leadership style after a heated National Council meeting on Wednesday failed to bring the matter to finality. This has set the stage for a bruising turf war which is likely to culminate in a special congress to be held in February next year, it has been established. The tense meeting came up with a resolution to slap a 10-year suspension on every party member who stood as an independent candidate for legislative and municipal seats after losing primary elections for the July 30 polls. The meeting, which took place at the Morgan Tsvangirai House party headquarters, formerly Harvest House in Harare, kicked off at 11:30am, with Chamisa threatening to expel party members opposed to his leadership. The meeting was held amid reports of widening fissures between Chamisa and MDC-T secretary-general Douglas Mwonzora. 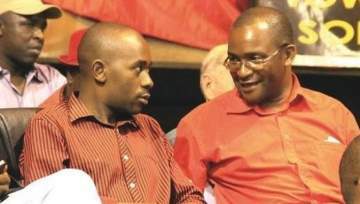 It is believed, Mwonzora, who trounced Chamisa in the race for the secretary-general position at the 2014 congress, harbours ambitions of wresting power from the 40-year-old leader who narrowly lost the recent presidential election to Zanu-PF candidate Emmerson Mnangagwa. The factional fissures are also expected to dominate nationwide consultations to be held with party structures tomorrow. Several senior MDC-T officials told the Zimbabwe Independent in off-the-record briefings that Chamisa read the riot act to those opposed to his leadership, warning them that they should leave the party on their own or risk humiliating expulsions. Chamisa also sought permission from the council to engage Zanu-PF for a possible truce following an emotional post-election period which saw violence erupting over a strongly disputed result. Both Zanu-PF and MDC-T blame each other for the violence, in which seven lives were lost when the military opened fire on protestors. “The president (Chamisa) started by threatening that he will use his powers to suspend and cause people to be expelled from the party before inviting those opposed to his leadership to form their own parties and use their own names. After that, he immediately asked the council to be given the mandate to dialogue with Zanu-PF to chart the way forward after the recent elections,” an MDC-T national council member said. MDC-T deputy national treasurer Charlton Hwende, however, suggested that, instead, what the party needed was to hold a workshop to properly examine why it had lost the election. But Chamisa, who has maintained he won the presidential election, which he says was rigged by Zanu-PF, reportedly rebuked Hwende, saying he did not want any discussions that suggested the election was lost. “There was a harsh rebuke from the president. The president didn’t want the narrative that we had lost the election,” the source said. MDC-T vice-president Elias Mudzuri, who is also reported to be highly critical of Chamisa, immediately leapt to Hwende’s defence and asked Chamisa to let him finish his submission. Chamisa then turned his guns towards him, revealed sources, who attended the meeting. “He clearly vented his irritations. He shouted that people did not respect him as the leader of the party. He then reminded Mudzuri that he was the president of the party and the rightful chairman of the meeting. He rhetorically asked Mudzuri to go upfront and chair the meeting if he thought he was capable and when Mudzuri remained glued to his seat, he (Chamisa) reminded him that he chided him saying he needed to learn to raise his hand first if he wants to be given permission to the speak next time,” another source who attended the meeting said. Things turned nasty when Mwonzora reportedly stood up and accused Chamisa of paying too much attention to gossip and misinformation from state security agents in a bid to expel him from the party ahead of the congress. “Mwonzora was unusually forthright. He told the meeting that he had had enough. He accused Chamisa of sending people to harass him and he wasn’t going to take it anymore. At this point, Chamisa interjected saying Mwonzora was clearly working against him and he enjoyed support from Zanu-PF since he was recently endorsed by (Zanu-PF politburo member and war veterans leader Victor) Matemadanda at a press conference,” the source said. At that point, sources said MDC-T secretary for home affairs Lillian Timveos moved a motion for the expulsion of Mwonzora and with the support of the party’s secretary for sport Clifford Hlatshwayo. The motion was, however, immediately countered by committee members Ben Chiondegwa and James Makore, and was thus put before the council for debate, during which the majority of the people said the best way to solve the problems was to convene an elective congress. “The matter was then put to vote and the overwhelming majority voted in favour of a congress. It was then decided that the congress must be held in six months, which means we shall have the congress in February next year,” a senior MDC official said. When contacted for comment yesterday, Mwonzora said he was not at liberty to discuss internal party issues with the press. “The national chairman (Morgen Komichi) has already given a statement on that and I don’t think there is anything else for me to add to that,” he said. Chamisa’s spokesman Nkululeko Sibanda also refused to comment on the issues. GRACE MUGABE’ SON, RUSSEL GORERAZA, EVICTED over US$65 801 rent arrears at his rented premises Number 4A Clarence Drive, Nikolas Point, Flat 3 Newlands.